One of the fundamental pillars of personal finance is the arena of wealth building. Analyzing the best ways to make money is essential, as we’ve discussed in the wealth building post from before. Out of all of the methods for building an income, one of the most popular is through dividend investing. Investing in dividend earning stocks is one of the best and certain methods for building a passive income, and it’s an opportunity that literally anyone can take advantage. Dividends are payments that corporations pay to their shareholders. If you own stock in a company, you are a shareholder. Dividends are usually paid on a quarterly basis, meaning 4 times a year — of course, this depends on the company in question. For example, if you own 200 shares in company X and they pay $0.25 per share in dividends per quarter, you will earn $50 per quarter equal to $200 a year. The more shares you own, the more you will be paid in dividends. Dividends are basically a way of sharing the profits. Companies take a portion of their profits and give it to their shareholders. Corporations know that this will keep their shareholders happy, helping to retain them and keep them invested in their company. Not all companies pay dividends as it is not a requirement for corporate stock. Often, older corporations that have a stabler stock price will issue dividends in order to show off their stability. They know that some investors only practice dividend investing, and want to attract their long-term investing in order to continue to enhance their stability. For example, Disney is a company that has been around for a while that doesn’t necessary have the kind of capable growth as a brand new company. Because of this, you won’t necessarily make a lot in capital gains from pure growth — at least not like back during their high-growth days. But at the same time they make a consistent profit and can afford to give a nice dividend to their shareholders regularly. Usually once a company starts paying dividends, they try to continue to do so regularly. If a company that normally pays $1 per share per quarter suddenly stops paying dividends after years of consistently paying them, that’s usually not a good sign for the company — it’s often a sign that their ability to provide shareholder profits has decreased for some reason. Occasionally this might happen if they instead decide to reinvest in the company for growth. In this case, following the company will allow you to have a heads up in these circumstances. Companies that pay high dividends are favorites among investors who are interested in income investing, like retirees. Individuals who like to see consistent income coming from their shares to use for monthly expenses like the consistency and would rather see monthly dividends instead of selling stock when they need cash. Of course, you don’t have to be retired to enjoy the benefits of dividend investing — the principles of passive income is the same for everyone. When researching companies for stock investing, always factor in dividends. The capital gains return might not look that good causing a stock to appear as if it’s not worth much, but once you factor in the dividends, the return may go up considerably. Another great advantage of dividend investing is the ability to reinvest dividends. Reinvesting dividends means you are taking the dividend payments and using them to buy more shares in the company. By reinvesting the dividends you make, you can buy more shares allowing you to earn more dividends. It’s possible to have your dividend income automatically reinvested in the stocks you own, allowing your net income shares to increase automatically without any active management on your part. 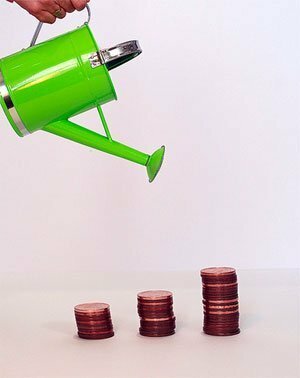 There are several ways to reinvest your dividends. One way is through a dividend reinvestment program, also known as a DRIP. You can enroll in a DRIP directly through the company. Search for a company that offers this program. You can often find an application right on their website. Often to start, you already need to own at least 1 share of stock. You can get one share through a program that offers 1 share to be sold at a time as gifts. They work for this very well. Through this program, you can buy more shares or you can just leave it alone and only have the dividends reinvested to acquire more shares of stock. Either way, whenever dividends are paid, instead of receiving them directly, they are automatically reinvested to buy more shares of stock. More shares mean more dividends to buy more shares, and so on and so forth. Dividends can also be reinvested if you have a brokerage account, including many online brokerage firms. You can ask them to reinvest all dividends, or you can choose to receive the dividends paid to yourself. Reinvesting is a great option to increase the value of your portfolio without being tempted to spend the money on other unnecessary things. The more shares you own, the more money in dividends you can get paid. In the end, dividend investing is easily one of the most secure forms of investing in stocks, because you still earn an income even if the price drops and you can’t afford to sell the stocks. Dividend investing are a staple of income investing, and any financial planning that’s based on long-term results. What is Preferred Stock, Types of Preferred Shares, and Risks? Shaun Connell is a full-time personal finance blogger and student living in rural Arkansas. He runs several blogs on investing and finance, including a daily blog on gold, and a weekly blog on wealth management. Shaun firmly believes in dividend investing, debt-free living, and long-term financial planning.